Following their path of development SAMAEL indeed are making a full circle in their creative work. The sound of their new album reminds most of the revolutionary for its time album “Passage” (1996). Here we face the same mix of aggressive black metal with keyboards and electronics and the same industrial rhythm and Eastern motives. As if the things have more depth here. The programming is not set on the edge which divides extreme from dance styles as it is in the music of SUNDOWN. And the Eastern motives do not reach excelling positions as it happens in the music of the folk metal bands. Balance and stability are the faces of SAMAEL for long years. 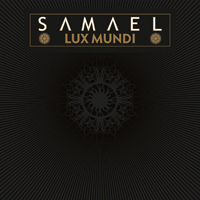 If someone has reproofs toward “Lux Mundi” then he has reproofs toward SAMAEL in general. They do not betray themselves!